What Can I Do with a Master's in Adult Education? Note: This page provides details on getting your Master's in Adult Education, for doctoral degree information please see our Ph.D. in Adult Education page. Adult education is not a field that is often discussed when people are reviewing teaching options. However, education is often a lifelong pursuit which means that adult educators are needed just as much as teachers of children. Adult education has been a formalized form of education for many years, but popularity of the field is growing as more and more individuals seek training outside of basic education. Classes can range from basic skills classes for individuals over 18 to specialized corporate trainings for CEOs. An adult education degree can help you further your career as one who prepares, plans, and administers a wide range of training to adults in postsecondary, corporate, K-12, or community settings. It is always reassuring to know that a program has proven success year after year. However, do keep in mind that online or distance learning is a relatively new phenomenon. Before signing on to an online Master's Degree in Adult Education program, find out how long the program has been offered. If it has not been around long enough to attain accreditation, consider it a clear red flag. Every school uses a different technology to facilitate learning, such as Moodle. Such online learning platforms include discussion boards and multimedia lectures. These virtual classrooms can be accessed online and usually do not require software installation. Some online learning environments are better than others, so it might be a good idea to review their system before signing on. Many schools will often give students access to online databases and research centers. This is very handy, as you will be required to conduct a lot of research over the course of your Master's Degree in Adult Education program. Schools will also offer student services such as technology assistance, mentorship programs, and advising. It's always helpful to find out what resources will be available for you before signing on. Good schools, whether online or on-campus, will have an organized plan of what students should have learned and be able to do upon completion of the program. This is often referred to as student learning outcomes. These are statements that describe skills, knowledge, and ideas that students should have after successfully completing program requirements. It's very helpful to know what graduates from a similar program have been able to do after acquiring their online Master's Degree in Adult Education. If given the opportunity to connect with alumni, find out how their online degree helped them reach career goals. Ask for advice regarding online learning and what to do after completion. Stay connected as networking is a great way to land a job after graduation. Online learning is a great option for students who are on the run and need to maintain a flexible schedule. Those who are independent learners and self-motivators may find success in online programs. However, distance learning may not be suitable for everyone. When exploring online programs, consider the following factors. As more students choose online programs, it seems one of the biggest appeals is the flexible schedule. In many cases, online students are returning students who have taken some time away from school. During their time away, they may have accumulated more work and family responsibilities. These responsibilities limit one's time and ability to attend traditional classes on a college campus. Distance learning does not require students to dramatically alter their daily schedule. Students can complete their school work whenever it fits into their schedules - that can be on a lunch break at work or late in the evening after putting the kids to bed. Hard deadlines and accountability milestones that keep students on track - such as presentations or reading reflections. Communal message boards and practicums to help you network and build career contacts. Final cumulative thesis, project, or portfolio. The quality of teachers is extremely important for the success of a program. This is especially important in an online setting, where students cannot rely on face-to-face interactions. It's a good idea to read faculty profiles. It's a good sign if you notice some also teach on campus programs. Are they full-time, tenured, part-time? Are any of the teachers working on their own research? Have they published any of their studies or articles? Are they collaborating with campus partners? What experiences do they have in the field they are teaching? You want teachers who have had real life experiences and who know the field inside and out. It's usually not a good sign when programs have an overabundance of under-qualified adjuncts on their faculty. Since students of online programs can study from home, they avoid costs associated with room and board as well as transportation. Students can maintain a source of income. You may not have to pay out-of-state fees. Online schools tend to have less overhead, making them more affordable. A common upside we here about earning an online degree is the rate at which it can be completed. In many cases, students can earn a degree faster in an online setting than they would have been able to at a traditional college campus. 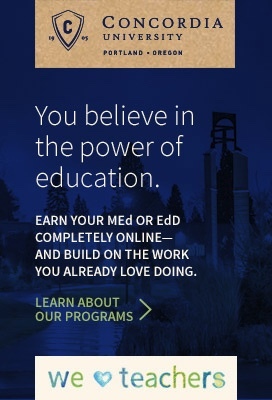 With an accelerated online degree program, keep in mind that the courses may be more rigorous. Always review the requirements and make sure an online school is accredited before signing on. A Master's Degree in Adult Education opens the doors to many career opportunities. Below are some common paths graduates take. Many Adult Education graduates go into a career of teaching adults in a classroom setting at colleges, universities, vocational schools, community colleges, and other educational establishments. Find out more on how to become a college professor. Those with a Master's Degree in Adult Education may also seek work as an administrator in order to help manage faculty, staff, and school curriculum. Adult Education graduates also tend to enter the field of Adult Counseling. Adult counselors work with clients at a variety of levels including crisis management, family counseling, and financial counseling. Adult Education graduates also become involved in education departments in settings such as healthcare organizations, human resources departments, training departments in business, and education departments in organizations for religion. In order to stay up-to-date and connected within your field, it may be a good idea to learn about affiliated organizations, such as the American Association for Adult and Continuing Education (AAACE). The AAACE is dedicated to the belief that lifelong learning impacts human fulfillment and positive social change. Such organizations organize conferences, webinars, and expos to help their members network and continuously grow professionally.